You can't go wrong with the Oki C830 for crystal clear printouts. After some time your Oki C830 will run dry of printer toner, and when that happens you'll soon come to realise that fresh Oki C830 toner is often expensive. However, you have no need to bother about dishing out the steep prices you'll discover on the high street because now at Cartridge Save you can buy all the Oki C 830 cartridges you'll want at very low prices. Spend less money by shopping online at Cartridge Save! Why spend so much on the C-830 original cartridge or C830 compatible toner down the high street when it is simple to save a wadge of money ordering with Cartridge Save. You can have utter confidence when you purchase C830 toner cartridges from us because each one is covered by a straight forward money back guarantee. Take into consideration that each purchase comes with free delivery, mostly arriving at your doorstep the following business day! The Oki C830 toner printer is classified as a wide-format/tabloid colour printer with versatility at the heart of its compact design. This workhorse of a machine features impressive print speeds of up to 30 pages per minute in colour and up to 32 pages per minute in monochrome. The C830 uses Single Pass Colour Digital technology to print on a variety of heavy weight substrates and can even print banners up to 121 cm long. Crisp, clear printing and copying outputs in color and monochrome are made possible by 1200 x 600 dpi resolution. The Oki C830 is compatible with most Windows and Mac operating systems. The compact footprint of the Oki C830 is ideal for desktop use. For a large format colour printer, the C830 weighs in at a reasonable 36 kg. The standard input tray holds 300 sheets of paper with an additional tray as an option which holds 530 sheets. The stylish frame of the C830 is an Okidata Solutions classic and fit for any front office use. The Oki C830 toner cartridge system is easily accessible and simple to operate. Very high print speeds ranging from 16-30 pages per minute for colour and 17-32 pages per minute on monochrome make the C830 a must-have for small to mid-size offices. 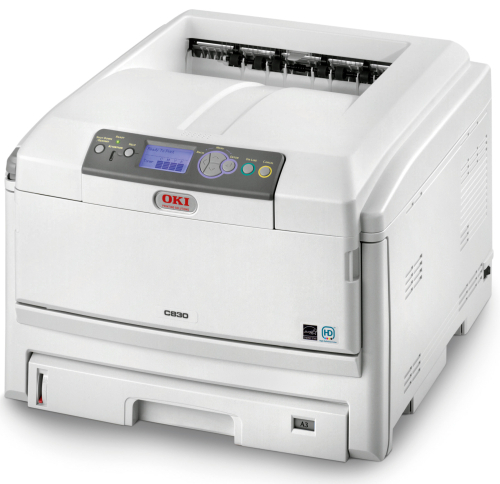 An impressive duty cycle of up to 75,000 pages per month proves the Oki C830's durability and reliability in and of itself. The Oki C830 toner cartridges are designed to handle up to 8,000 pages in their life cycles based on 5 percent coverage. The Oki C830 lacks some compatibility options seen in other similar lines, but still maintains a strong Windows and Mac baseline.